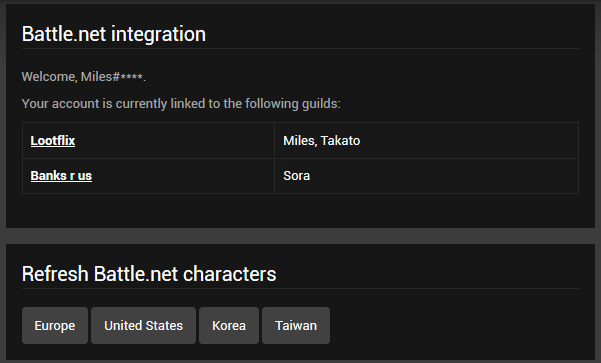 After your character list is refreshed, follow the link to the guild and refresh it's members - that will fetch the guild's roster from WoW and update your character's guild rank. Your effective access is determined by your highest ranking character in the guild. For access control, the guild master (rank 0) and officiers (rank 1) have access to all the guild settings, like your guild's introduction message, recruitment status, privacy settings and more. All members by default have access to the guild's private information that require login, like private reports. Currently, the rank 1 limit is fixed, we'll work on adding a preference to change it to a different number.